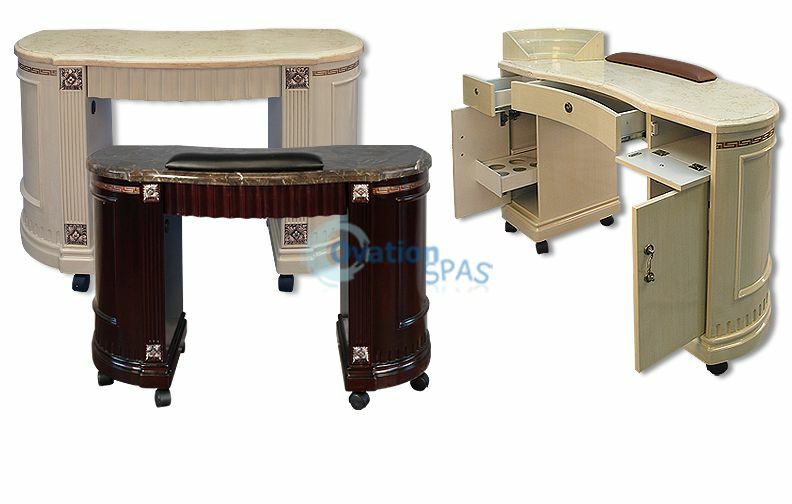 ZM Compact Saver manicure table is elegant nail table with generous storage and 2 colors choice of laminate wood and marble top. It's functionality and appearance impresses both the customer and employees. This item can only be shipped by trucking company, Please call for freight cost estimation. Oversize items are shipped via ground freight. The delivery company is not responsible for unloading the item from the truck, carrying it into your home, or assembling the item. Therefore, we recommend that you have help available when accepting delivery. If the necessary assistance cannot be attained, please contact the freight company directly to ask for any special service upgrades which they may offer. The freight company will contact you in order to schedule a delivery date and time. Typically, there will be a four-hour time frame for the delivery and someone must be present for the item to be delivered. If you are not present at the scheduled delivery appointment you will be subject to a "Re-delivery Fee," which must be paid at the time of your re-delivery. Please inspect the package thoroughly before signing for the delivery. It is normal for packaging to show some wear; however, please carefully inspect the item for any potential damage that may have occurred during shipment. 1) Take picture of the pallet before signing the deliver receipt. If failure to comply with this procedure, we will be not be held responsible for any damage replacement nor refund. Please note: Currently in order to ship oversize items to Alaska, Hawaii, U.S. protectorates and territories, or APO/FPO addresses, please contact Customer Service for further assistance.